Mosaic is a new community in Daytona Beach by ICI Homes. DAYTONA BEACH, Fla. - April 4, 2018 - PRLog -- ICI Homes proudly announces Adley Homes has joined the preferred builder group at Mosaic, a new master-planned community in Daytona Beach offering a close-knit community lifestyle for the young and the young at heart. "With its excellent reputation, dedication and commitment to quality, we are excited to partner with Adley Homes," said ICI Homes Chief Operating Officer Tom McCall. "Adley Homes will bring additional design choices to Mosaic and complement the high quality standards for which ICI Homes is known." Adley Homes has created a portfolio of home designs that meet every lifestyle and has two model homes under construction in Mosaic. Adley Homes is under the leadership of Jamie Adley, who has more than 30 years of experience in the real estate industry including extensive product and project knowledge. "Adley Homes is very excited and honored to be chosen to participate in Mosaic's preferred builder program," said Jamie Adley. "Mosaic is one of the best master-planned communities in the area and I think with its convenient location and great amenities, Mosaic will be extremely successful." Mosaic will feature a selection of one- and two-story, energy-efficient smart homes with spacious, open floor plans ranging in size from 1,650 square feet to more than 3,000 square feet of living space. In addition to the spectacular conservation and lake views of the community, homes will offer a variety of exterior elevations including traditional and modern styles. The community's homes will be customizable to suit the homebuyer's preferences and needs. Home and home-site packages at Mosaic are priced from the mid-$200s to over $500,000. Designed with an abundance of social spaces perfect for gathering and connecting with others, Mosaic residents will enjoy a magnificent lifestyle. Club Mosaic will feature a recreational complex including two swimming pools, event lawn, state-of-the-art fitness center, amphitheater and a grand activity room. A picturesque boardwalk will flank Lake Mosaic where residents can spend a sunny afternoon fishing or enjoying peaceful relaxation. Mosaic will include a connected network of wide sidewalks, pathways and boardwalks, perfect for walking or running and offering scenic spots to sit, relax and enjoy the views. Children will enjoy Hopscotch, Mosaic's tot-friendly playground, and a community garden for all ages. Residents may enjoy a picnic by the water or an open-mic night at the Kaleidoscope Amphitheater. Throughout the community, WiFi hotspots will provide connectivity to many gathering spots throughout Mosaic. 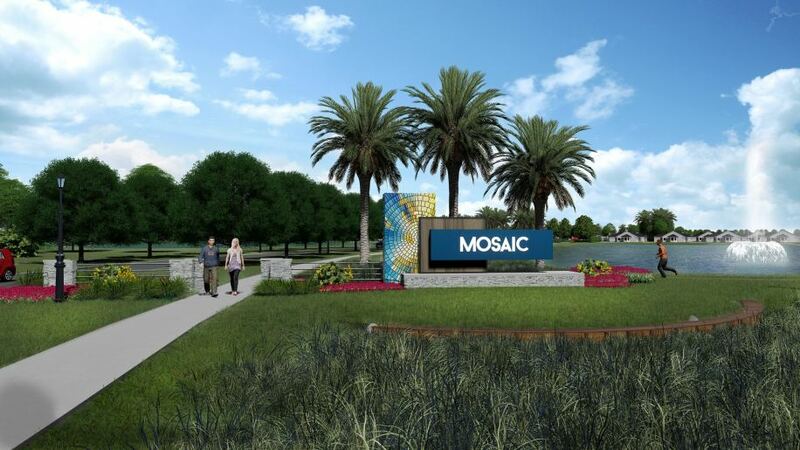 Mosaic is an exciting new community in Daytona Beach by ICI Homes. To learn more, schedule a VIP appointment. Call (386) 222-0150 or visit www.mosaicdaytona.com.